ICE West Midlands organises and takes part in educational events for people aged under 19. These events help young people understand what civil engineering is and encourage them to think about a career in the profession. Our activities are organised by the Education and Inspiration Committee chaired by Jo Haskins. Enthusiastic ambassadors are always needed to help out at events, whether it's manning a stand at a careers fair, or helping to run a classroom activity. To find out more, contact us at: [email protected] or follow us on Twitter: @ICEeducateMids. We carry out a range of activities with schools across the region to help promote understanding of civil engineering and inspire young people. If you've got a question or want to arrange a visit then let us know. 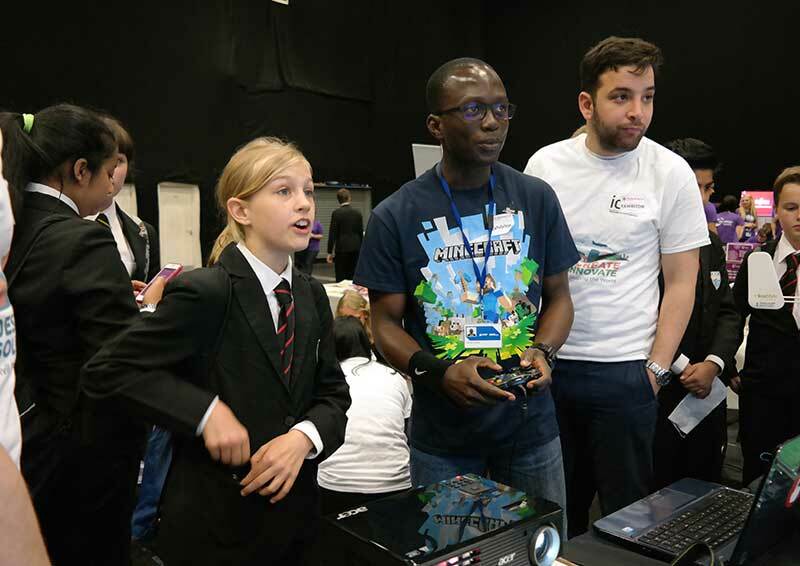 Gbenga Oludotun, ICE West Midlands volunteer and Education and Inspiration Committee member, has created a new Minecraft challenge to help children make the link between their favourite online game and the world of civil engineering. Kids queued up at this year's Big Bang at Coventry Ricoh Arena to take part in the challenge. Their teachers said they'd never seen them so focused on an activity! Boys and girls aged between 8 and 12 were given a set of virtual materials and asked to use their imaginations to build a bridge; harbour or structure using a set of Minecraft tools and materials in a mini virtual environment set up by Gbenga. Many of them were very familiar with Minecraft and knew more about it than Gbenga a civil engineer with a penchant for video games, however he was able to help them make the connection between the game and the real world of civil engineering. Gbenga, said: "The project aims to find out how children interact with the game and what they can achieve from it. We are hoping to develop it further and roll out as a mini-competition to schools in the region and, hopefully across the UK." Comments from children who took part in the activity confirmed that it had made them want to know more about civil engineering as a career. The Education and Inspiration Committee plan to roll out the Minecraft activity for use in local schools, as a novel way to engage children in the world of civil engineering. To find out more about educational activities in the West Midlands contact us at: [email protected] or 0121 2373640. Civil engineers have been using their skills to transform Birmingham New Street station and its surroundings. Network Rail says "The redeveloped Birmingham New Street station opened its doors to passengers on 20 September 2015 after a five-year, £750m transformation. Boasting an iconic new atrium over a huge passenger concourse - five times the size of London Euston's - the station has been rebuilt while trains continued to run as normal for the 170,000 passengers a day who use it. With brighter, de-cluttered platforms, improved entrances, a range of new facilities and an abundance of natural light over the new concourse, Birmingham New Street, one of Britain's busiest inter-change stations, is also a retail destination in its own right. The new station will feature 43 shops at concourse level and above it sits the new Grand Central shopping complex, including one of the UK's largest John Lewis department stores. The 450,000 sq ft shopping destination will create more than 1,000 jobs and is expected to attract more than 50 million visitors a year. To help promote civil engineering achievements close to you and across the UK, we're running a campaign called This is Civil Engineering. We're highlighting projects across the UK that are helping to improve lives and improve our environment.